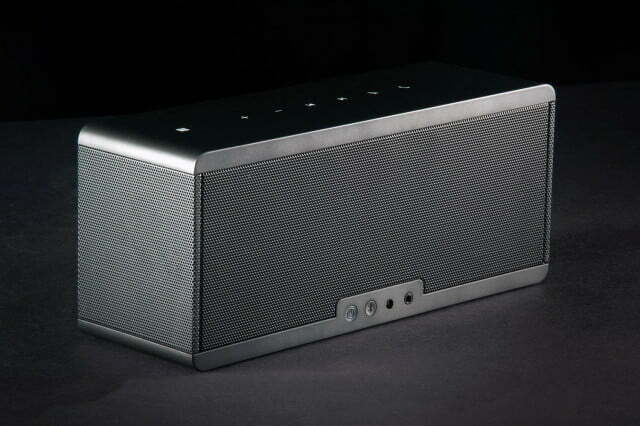 Can a speaker the size of a Kleenex box really replace your surround system? Theatre Box sounds the same from any angle, and spreads itself out to sound much larger than it actually is. 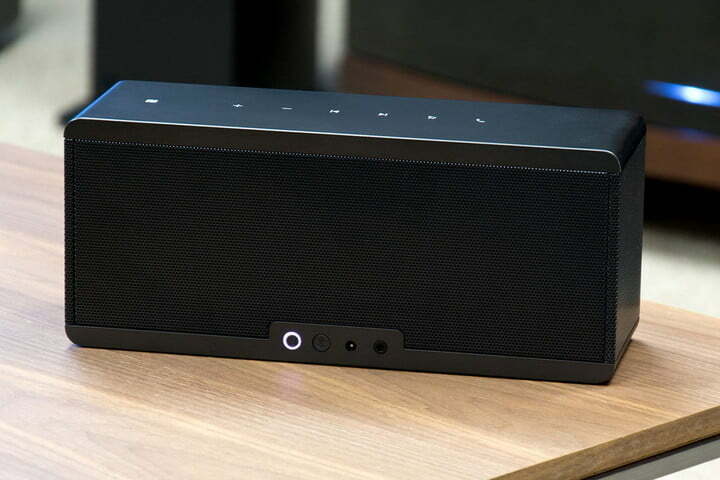 Startup Acemile has crafted what it considers the world’s first commercially-available 360-degree surround sound wireless speaker with its Theatre Box, a unit small enough to carry around almost anywhere, yet with fidelity that can fill a room with ease. With speakers firing in four different directions, music and movie tracks are supposed to surround you. Can it replace a full-on home theater system? Of course not. But we’ve heard two-channel sound bars twice the size that didn’t sound as good, yet cost as much — that says a lot for this little speaker. But what about its merits as a portable speaker? If the only qualifying factor for calling a speaker portable is that it has a rechargeable battery, then the Theatre Box makes the cut. If, however, you expect fancy features like a handle and maybe light-weight design to make the speaker easily tote-able, then the Theatre Box falls short like so many other speakers in its class. At 3.6 lbs. the speaker makes its presence known in your backpack, which is probably where you’ll put it since it has no easy way to carry it. But that might be ok, because while the Theatre Box can be taken on the go, it shines brightest indoors, where your anemic-sounding entertainment devices (from smart phones, to tablets, laptops and TVs) could no doubt use a serious boost in sound quality. The box the unit comes in isn’t particularly snazzy, though we sort of dug the way we could slide it out from the side. Four different Theatre Box colors — black, white, blue and ruby — are depicted on the back, though it seems the black and blue models are the ones getting priority, given they are the only ones available from Acemile’s website. The white and ruby ones are expected to be available in the fall. On the inside, there isn’t much to note. The speaker itself is nestled between two pieces of foam, and underneath those are the power adapter, a flat 3.5mm line-in cable and small six-page user manual. 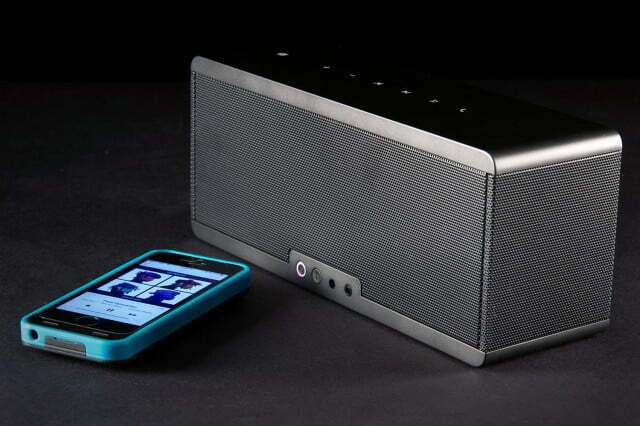 The Theatre Box eschews the design flair that others in the portable speaker market flaunt in favor of a neutral look that is likely to please purists without alienating the masses. In keeping with the premise behind the speaker, there are grilles surrounding the front, back and sides where all four of the 2-inch drivers are inside the chassis. There’s also a 3-inch rear-firing bass driver inside, along with a built-in 360-degree microphone. 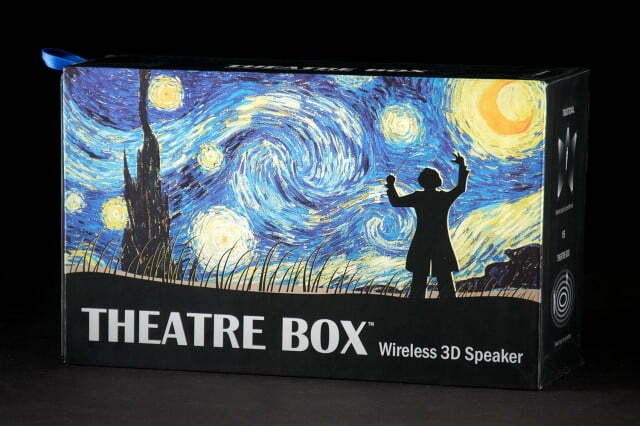 The good thing about the basic design principles used here is that the Theatre Box fits in just about anywhere. 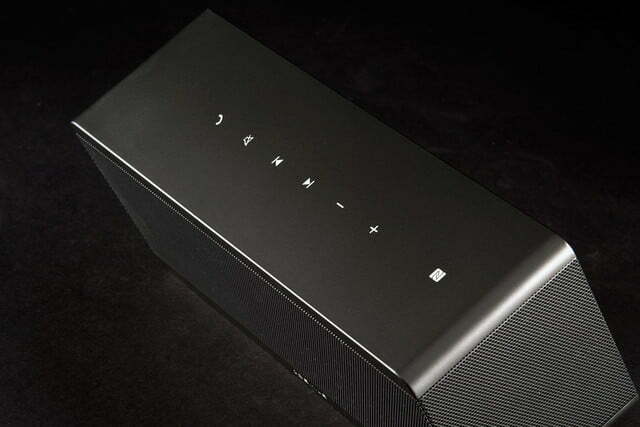 Along the top are touch-sensitive controls that include volume, back/forward skip, mute, call answer and NFC. They are backlit with LEDs inside, except the lighting appears only when the buttons are pressed, meaning the backlighting does the user no good in the dark. On the back are power and Bluetooth buttons, alongside a charging port and Aux-In jack. Notably missing is a USB port, either a female one to charge a smartphone or a micro-USB to charge the Theatre Box itself. The power adapter comes in two parts with an AC power converter in the middle. 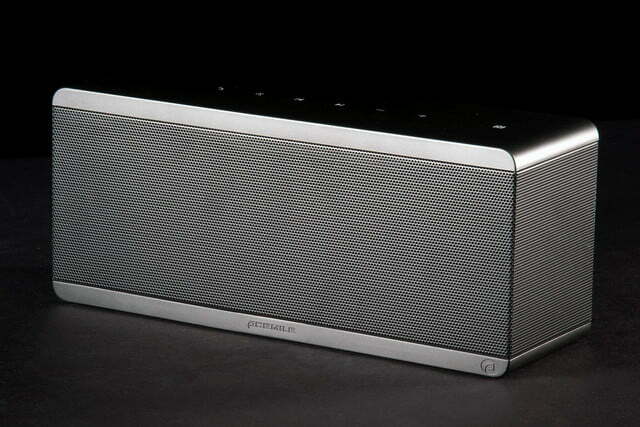 Given the size of the speaker and the battery inside, we’re not particularly surprised by that. The good thing about the basic design principles used here is that the Theatre Box fits in just about anywhere. Put it on a bookshelf, kitchen counter, home entertainment setup, night table or even on a patio in the backyard and it’s unlikely you would ever feel like it doesn’t belong there. The lack of flash and innovative design on the outside might seem uninspiring, but the neutral look doesn’t really work against the Theatre Box in the grander scheme. The Theatre Box uses what’s called Q3D Holophony, a form of wave field synthesis that is supposed to propagate sound waves in a larger space without losing its fidelity. In a nod to audiophiles, Acemile is quick to point out that lossless audio file formats like WAV, FLAC and Apple Lossless are supported here, though that really has more to do with the playback device connected to it. The real point is that the company believes the Theatre Box can offer the kind of clarity and fidelity for these formats that even the most sensitive ears can appreciate. Of course, at a $300 price point, this isn’t purely a niche product aimed at self-respecting audiophiles, it’s in range to appeal to a much wider mass. And given that it doesn’t try to pack in too many features, we found it easy to gauge performance based on those merits, coming away pleasantly surprised at some of the ways in which we used it. The radial nature of the speaker was noticeable early on, though it required placing it further away from a wall to appreciate the effect. We walked around it often or sat nearby at different angles, finding it impressive at how well it resonated no matter where we were. 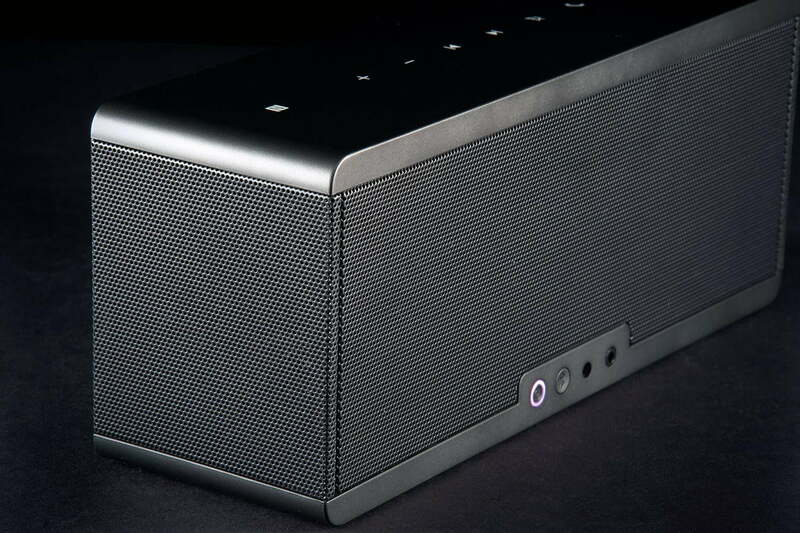 The components inside are also capable of going pretty loud, easily able to fill a room with booming sound. As expected, distortion did set in when cranking it up to 11, but this also depended on the type of music being played, and the nature of the audio file’s quality. For example, playing a lossless version of Bon Jovi’s Wanted Dead Or Alive, then streaming it from Spotify showed a slight difference in output, but only at the highest volumes. The bass didn’t creak as much, while the vocals and guitar riffs didn’t sound like they meshed into one channel. Once we lowered the volume, however, things were less distinct. We tried the same approach with Ella Henderson’s Ghost, Rick James’ Give It To Me Baby and ZZ Top’s Sharp Dressed Man and found similar results. Bass-heavy hip hop tracks like 2Pac’s How Do You Want It and Warren G’s World Wide Ryders fared no better or worse. Without a doubt, the speaker’s greatest strength is its ability to sound much larger than it is. This kind of consistency is welcome, especially compared to some manufacturers who scale the equalizer too far in one direction. Stereo separation is notable, but we sometimes found it hard to distinguish and contrast the Theatre Box’s performance with everything else on the market. What we liked was the quality retention as the speaker got louder. Generally, the highs and mids maintained their integrity, while the lows only started to lose their presence at the loudest volumes. We could get close to the highest setting and still feel like the music didn’t collapse into some ugly jumble of distorted melodies and vocals. 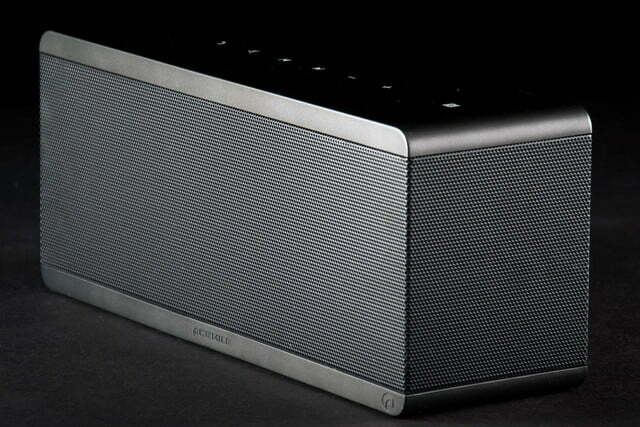 Without a doubt, the speaker’s greatest strength is its ability to sound much larger than it is. Between the drivers firing in multiple directions and Acemile’s processing, the speaker is capable of providing an expansive sound that gives the listener a sense of immersion. It’s no substitute for a quality sound bar/subwoofer combo, but it’s far superior to most TVs’ speakers in both the volume and quality of sound it reproduces. Of course, this works best when the listener is seated at a distance, and when there are solid surfaces to the left, right and behind to reflect sound, but in such an environment, the Theatre Box lives up to its name as a super-compact source of audio entertainment. If there’s a downside to this for us, it’s that the 3-D/Surround effect can’t be disabled, and for music listening, we didn’t care for the spread-out sound so much. More casual listeners probably won’t see any issue with it – it’s just a matter of personal taste. We also liked some of the speaker’s more nuanced elements. The will say “connected” once it pairs with a device, and then make a “whoosh” sound when powered off; battery levels are only indicated audibly when the Theatre Box is running low on juice ; NFC pairing is also very easy to manage. The touch-sensitive buttons, on the other hand, are perhaps a little too sensitive and precise. At times, we had to touch a button twice to register, or it responded slowly when pressing one button, like volume up, repeatedly. This became a bit of a nuisance in those instances where a phone call would come in and we had to crank up the volume just to hear the caller. As a speakerphone, the Theatre Box is decent, but doesn’t really offer anything unique or exceptional. Naturally, cellular reception is the ultimate arbiter of how good this feature is, and we found mixed results in that regard. Music playback is interrupted when an incoming call comes in, resulting in a dramatic drop in volume level. Acemile says the speaker automatically defaults to a lower setting for calls in case music is playing at a very high volume, forcing users to lower it manually. When done once, the Theatre Box remembers the phone’s volume and sticks to it, only to reset again when the speaker turns off, leading to a repeat of the lower default. We tried the Theatre Box in a few different scenarios, since Acemile likes to position the unit’s versatility. We plugged it into a TV to act as the external speaker and were impressed at how well it stood up. TVs generally don’t have Bluetooth, so a line-in cable is the only way to make this work. That’s great for removing latency, but can also limit placement – esecially considering how short the included cable is. With a wireless TV, the 3D sound effect could be even more pronounced if the speaker was free to be placed in whichever spot provided optimal sound quality. In the bedroom, we kept the Theatre Box on a night table and had it connected to a tablet to watch movies, shows and live sports. With the speaker off to the side, the sound never hit us frontally, but the effect was still noticeable, if only because the clarity it offers is miles ahead of the built-in speakers tablets have. When paired with a video game console, we experimented with having the speaker behind us, off to the side or only a few feet in front of us. It fell far short of emulating a true surround sound setup, but it was still a major improvement over TV speakers, adding depth to the various sounds and background music that are typically in games nowadays. As for battery life, Acemile rates it at 20 hours, but as many know: The louder a speaker plays, the faster the battery will drain. Expect closer to 17-18 hours at higher volumes. Acemile clearly didn’t take much of a risk in designing the look of the Theatre Box, opting instead to make it neutral enough to fit in anywhere and let the audio speak for itself. For the most part, it does, offering both solid spatial separation and spatial resonance in a way that does sound unique for its class. The fact that the speaker can sound the same from varying angles is undoubtedly appealing for situations where groups of people are congregating in one place. Given that Acemile stepped into a crowded space, and the Theatre Box isn’t the prettiest speaker on the market, the $300 price tag seems appropriate, primarily for the unique way it approaches sound. On those credentials alone, this is a compelling option to consider, even if it does feel a little like taking a chance on an unknown.